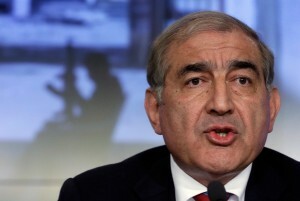 Russian Foreign Minister Sergei Lavrov is set to meet Syria’s Deputy Prime Minister Qadri Jamil on Monday to discuss the conflict in the region, both political and economic. During a visit to Moscow in April, Qadri discussed extending a Russian loan to Damascus. Syria’s state exchequer has lost around $33 billion since the conflict began. The exchange rate of the country’s national currency, the Syrian pound, has fallen from approximately 50 pounds to a dollar in March 2011 to the current 100 pounds to a dollar. Meanwhile, the new leader of Syria’s main opposition coalition, Ahmad Jarba is set to meet French President Francois Hollande on Wednesday. Jarba has refused to attend the Russia, US backed peace talks in Geneva later this year stating that the rebels need to be strengthened militarily before they can participate in talks. The new leader has confirmed Saudi Arabia’s leading role in supporting the Syrian rebels and that arms from the country will reach Syria soon. “I think the situation is better than before. I think these weapons will arrive in Syria soon,” he said in an interview to Reuters. Up to 25 Syrian civilians were killed and over 85 others injured on Sunday when Syrian opposition forces fired in the northwestern province of Idlib, according to a pro-government report on Sham FM radio. Chinese news agency Xinhua quoted sources to report that the violence was committed by the Free Syrian Army. The ongoing violence has claimed the lives of around 100,000 people, according to latest United Nations estimates. The UN has said half of the Syrian population will soon need aid and has launched the biggest ever appeal for humanitarian support for the crisis-torn country.